Col A - is this 1960? I think this must be summer 1960, but I'm sure somebody will correct me if I'm wrong. I'm sure it's not as late as 1961, and it could hardly be earlier than 1959. Last edited by eucsgmrc on Tue Aug 11, 2015 3:04 pm, edited 1 time in total. Re: Col A - is this 1960? Next to Kit is the master who had been a professor in Spain and next to Mrs Riches is Mr Potts. Potts arrived in September 1960 because I had him for my last year of A level Chemistry. There was a rule that in your A level year you had to do 2 periods of a language you hadn't done before. For me the only possibility was German which I didn't want so this master gave me Spanish which I did at the back of the German class! I therefore would have thought that this was autumn 1960 or summer 1961. However Ashton already had 3 S levels then and was doing another three but is shown without buttons. The ironic thing is that, having worked / lived in those countries I got to speak four other languages without problems but when I had 2 years of one-to-one German lessons nothing whatsoever went in! That's Mr Herbert, I think. I ... would have thought that this was autumn 1960 or summer 1961. However Ashton already had 3 S levels then and was doing another three but is shown without buttons. As I remember things, which is admittedly no better than dimly, Ian Packington was house captain in 1960-61, and in this photo I see him half-way along the right hand side of the monitors' row. So I think it's 1960. Embarrassingly, this is a photo that I took myself, one year when Kit was so misguided as to allow me to do the house photo instead of a professional from Horsham. The scan is direct from the quarter-plate glass negative. And it's embarrassing because (a) I have forgotten when it was, and (b) it was a rubbish photo. Such honesty John. The photo ain't THAT bad, though !! 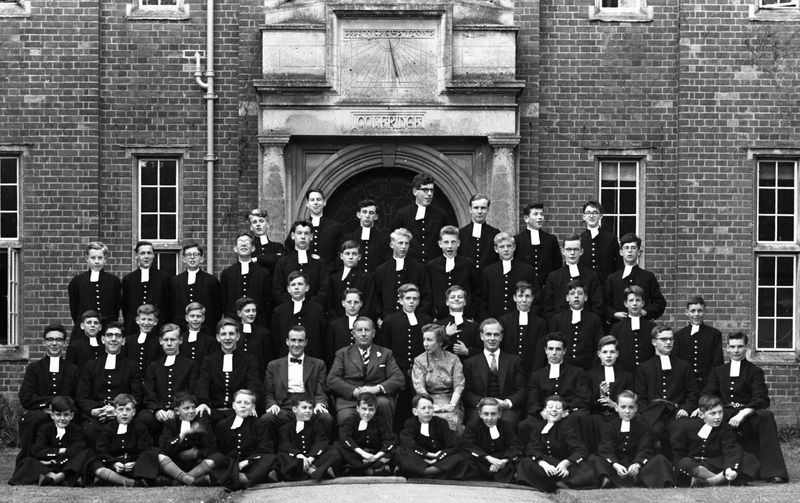 The housemaster in the bow tie was David Herbert. He taught English. He edited an anthology of narrative poems which became our A level text book. He was interested in tennis and he and Potts took a few of us to Wimbledon one year. He was my first junior housemaster in ThB, unfortunately only for about a month, as he was standing in for Phil Davies, who was on a British Lions tour of South Africa. Looking at the row that would agree with my year whilst in Col B, I reckon 1960 is about right. Strangely, I don't recall either of the two junior housemasters. michael scuffil wrote: ... if you took it, John, how long a delay did you give it? You're there in the top row, which must have involved a climb. Well spotted, Michael. Actually there was no delay. I used a camera with no such sophistication. I had to get somebody - fortunately, I forget who - from Col B to fire the shutter. We took at least four shots, and this was the only one where he managed not to shake the camera and blur the image. That taught me a lesson for which I ought to be grateful. It certainly wasn't me ! - Mr Herbert taught me Spanish which I did in the back of the German class - but only for one year before I left. Contrarywise I am in the photo and I left long before the end of term in 1961 to start a job. My memory is that photos were taken in the summer term - IF this was in the Autumn term then the above does not add up. Are any of the squits in the photo members of the Forum and able to write when they joined? How age has dulled my mind. David, (above) is probably correct. He seems to retain all knowledge Coleridge of his era. I certainly recognise several 'faces' but couldn't possibly have been able to put names to them. After all this time it's interesting to try and put names to faces but I think I can still name the Grecians row plus a few others, even though I was in Col B. Back row, third from right, is our old friend Banker Brown, already dreaming of the opportunities for currency speculators if only someone might deconstruct the troublesome Keynesian money snake that was put in place at Bretton Woods and which did much to keep money and economies stable after the war. Until 1971 when Nixon duly did the deconstructing in order to create more liquidity to keep fighting the Vietnam war and there was then a rash of speculative activity and inflation. This was a key factor in helping blow the 70s off course, although the right wing in this country will always try and blame the unions. The unions were just one contributing factor among many and I made this point in one of my letters in the Guardian. But of course all this was chickenfeed compared to what happened when Nigel Lawson and Thatcher deregulated the City in 1986 and really let the riverboat gamblers loose, and indeed what Reagan and others did in America. It was actually the Democrat Clinton who abolished the useful Glass Steagall Act, just as Gordon Brown over here praised the City for their antics in his Mansion House speech, all of five minutes before the boom turned to bust. As many economists, and indeed the American rock band Blood Sweat and Tears, observed: "What goes up must come down". Incidentally, re the date: my exact contemporary Hitchcock was house captain (and a third-year Grecian) in 1962/63. In this photo he is not even in the back row (he's the guy with his mouth wide open in the 2nd row down) and so presumably still a dep. Same goes for Peter Hiner (another exact contemporary, second monitor in 62/63). If you simply work out the years backward from summer 1963, this must mean it was taken in summer 1960. Thankyou, Michael - your logic agrees with mine: this must be summer 1960. But what stirred this topic up from the mud at the bottom of the duckpond of memory, where it has lain undisturbed since a bit of discussion in 2016?